Thank you for stopping in to read our blog! He is risen! As followers of Christ, we have the joy of sharing the Good News to a lost and dying world. During the month of April in this East Indian culture, the various hindu sects are even more energized it seems to carry on with their activities. The beating of drums to call their gods (demons) go on day and night. Sundays are especially busy as they walk through the streets making noise and begging for food and money to perform their religious functions. The hindu word for their April "fest" is called "Navratri", which can actually be repeated again in the fall. Sometimes it is hard to distinguish when they start and stop, as our area has several temples that seem to go on indescriminately with their chanting and drums. Please pray for us as we live and work among people who live in the shadow of fear and death on a daily basis. Pray that as we share the gospel that it's light would penetrate the darkest corner and individual heart. We are not surprised when the enemy of our souls launches an all -out attack, as we are commanded to "put on the whole armor of God in order to stand against the wiles of the devil". (Eph. 6:11) Lately the attack has been launched against several members of the Hampshire Bible Church. Please pray for our Christian families, as many are struggling in keeping their marriage together. The oppression is real. The battle is waged. We must stand strong together and be willing to go after the sheep who wander from the fold. Pray for the pastors and their families in the Association of Bible Churches. We are all on the front lines of this spiritual battle. On a lighter note, we praise God that the Alness church reconstruction project is moving along at a good pace. Attached are the most recent pictures of progress both inside and out. Reinforcement of the back wall was necessary, as the structure is quite old and was leaning. Eventually, concrete will be poured for the floor. The purple heart wooden front door is ready to install. The new windows have been purchased. It's starting to take shape! 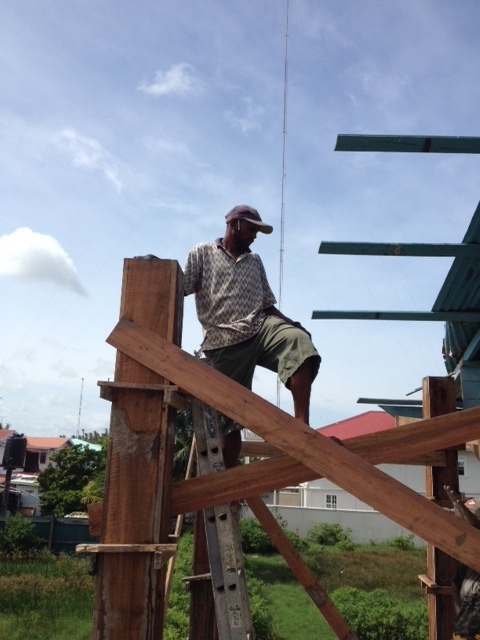 The local workers are on site daily under the watchful eye of "contractor Andy". It seems that Kathleen's famous phrase here, "It's a mans world" will have to be toned down soon, as all the pastors wives and one PWIT (pastor wife in training) will get their own mini retreat! Please pray for Kathleen, Naomi, Mala, Shelly, Joy, Ruby, Debra, Evelyn, Galina, and Anita (Morzeina is caring for her dying mother and can't attend) as together they "get out of town" from April 29 - May 1. This has come about after much prayer, planning, and rejoicing as special guests Indra Boodram and Chenelle will be coming from Tobago to speak and to encourage the ladies. It is very difficult to gather together these ladies and make arrangements for them to leave husbands and children even for a few days in this culture. Needless to say, they need it! Once again, we are so grateful for our faithful prayer partners and supporters. Thank you for standing with us. It's hard to believe that the first group of guys (and one gal) have come and gone already! Seven of the eleven that arrived Monday morning put in a solid 4 days of hard labor. You can see by the attached pics that the wall, as of tonight, is up!. The remaining 4 men, including pastor Doug Knorr, will fly out early Sunday morning. Tomorrow is the last day of class. On Wednesday we were joined by another two men from Ionia area, MI. Ryan and Wayne are busy working on the church building itself, adding the front portico. The highlight of the week, in addition to accomplishing so much on the project, was being able to hunt alligator in the rice fields. So tonight, alligator was on the menu! Thank you for praying for us all as we strive to complete "phase one" of the Alness camp/church project. The sun is shining, the team is healthy, and so far no injuries. Keep praying! It is encouraging to know that we are being held up by the prayers of Gods' people. Speaking of work, the house was already buzzing with activity upon our arrival. Four men from Grace Bible Church, Indiana, were staying in one of the bunk rooms, hosted by pastor Vishal and Naomi. Kathleen certainly needed the time to get unpacked and reaclimated to everything happening here, so was more than willing to have Naomi continue the cooking and team care through the weekend. Now that the men are gone, along with Vishal and Naomi, we are settling in and getting things in place for the next crew of eleven (from Michigan) due to arrive this week Friday. As you can see by the pictures below, a LOT was accomplished in the short time the first team was here. The Alness property is undergoing a transformation, as the wall goes up and the old church is being renovated. A big thank you to all who are praying for this project! Please continue to pray for the safety of the workers, good weather (the rains are coming), and additional funding needed. Please continue to pray for the Kwakwani ministry. Andy is leaving early tomorrow morning (January 29) for a quick trip into the village. It's a long journey, but necessary in preparation for the dental team arriving in March. Bro. Prem and Sis. Anita are all alone in the ministry there, please pray that the Lord would provide another family to join them in the future. Be on the lookout for more short updates with pictures from the ongoing Alness project. Busy days ahead...praise God for all who come alongside us in the work of church planting! It's a new year and a new knee, but the same old story - "Jesus died for sinners". We have the privilege of sharing that glorious truth as we return to Guyana on January 24. Thank you for praying for Andy during this time of surgery and recuperation. He is making progress, so we are still on schedule to fly back next week. Please pray for our coworkers in Guyana, all of whom are busy in their various church ministries. Especially pastor Vishal and Naomi, as they move into our Nigg house this weekend ahead of our return. The first work team arrives on Jan. 20, so Kathleen's partner in hospitality will be hosting the men until we arrive. Once we land, the pace will accelerate quickly as the next team arrives just a week later along with BBI/SRTS teacher Doug Knorr. Yes, we will hit the ground running, so your prayers for stamina, safety, and good health are greatly appreciated! As a reminder, the work teams are putting up the fence/wall for the new Alness property. Much groundwork for that has already been done, thanks to the labors of bro. Bobby and crew, along with volunteer help from the pastors and laymen. The wall is actually made up of concrete blocks. The existing building on the property, an old wooden church, will also be renovated. Most of the funding for the first phase is in place, praise God, so the materials are purchased and on site, ready to go. Soon after the work teams leave, preparations will go into high gear for the incoming dental team due on March 9. For the first time, this large group of dentists, hygienists, and assistants will travel with us into the remote village of Kwakwani. Please be in prayer for the team and for the final preparations in setting up in Kwakwani for this group. Pray for the hundreds of people who will come through the 5 day full-service clinic to be held in the Kwakwani Bible Church. Every person is not only seen individually by the dental team, but also is presented with the gospel and prayed for before leaving the clinic. The gospel is the power of God unto salvation to every one who believes! We will miss our family and friends here in Michigan, it's been a special blessing to be able to spend extra time with grand children especially. At times we are overwhelmed by God's goodness and grace. But it is time to return to minister to our "other family" in Guyana. May God bless you as you serve Him in your own field where He has planted you! Field Address: Lot 28 Campbell St.
Where do we begin? The past two months have been jam-packed with travel, ministry, illness, visitors, shipment arriving, and surprise developments along the way. We returned to Guyana on September 3, only to find that Andy's back had worsened to the point of extreme pain and near disability. He spent several weeks laying on the floor, in spite of all that was going on around us at the time. It's amazing what can be accomplished with a cell phone and delegation! (and a good wife...) Many were praying for us during that time, including beloved Guyanese co-workers, and praise God, Andy was able to stand and preach for the first time in 2 months during our trip into Kwakwani September 30. (see attached pics of that trip) No, you can't keep a good man down, even though he was in pain, he would go to church and still preach every Sunday sitting on a stool. Granted, the sermons were a bit shorter in length! We have much to be grateful for, especially our prayer partners who faithfully bring us and our family before the Throne of Grace. God has answered prayer - Andy's back is completely healed and he's up and able to move without pain again. Our home here in Nigg is aptly dubbed the "hospitality house". Since arriving, we have had the privilege of hosting several visiting professors and their wives. Dr. Rick Gregory and his wife Pat came in the first week of September, only to find both of us very ill with the flu, along with Andy on his back! Rick did an excellent job teaching in the Bible Institute and Seminary, and Pat and Kathleen hosted a mini pastors wives retreat right in our home. Somehow we all survived the week and as far as we know, our guests didn't catch the bug! Soon after the Gregorys left, Dr. Birbal Boodram and his wife Shano arrived from Trinidad to teach and encourage the ABC leadership. During their visit, the ABC met for a "Day of Prayer" at the Tain Bible Church. Since Andy was unable to stand, Kathleen had the privilege of sharing a brief history of the "Girwarnauth's in Guyana" and the Association of Bible Churches for the past 30 years: 1988 - 2018. Yes, it has been 30 years since our family first came to do pioneer church planting in the Berbice region of Guyana. Many of you have stood by us all these years to the glory of God! And finally, as of this writing, we are privileged to host Dr. John Grassmick and his wife Karen who are with us for this week of classes. Dr. John is teaching the book of Joshua, and Karen is busy babysitting the small children of pastors wives attending. It is a joy for us to be able to host so many visitors and teams throughout the year, many of whom are surprised to find this house has enough beds for up to 35 people! As you can see by the attached pictures, driving into Kwakwani is an adventure by itself. From our home to the Kwakwani trail takes about 3 hours. Once on the "trail", depending on weather conditions, potholes, etc., it takes another 2 - 5 hours. The ladies will appreciate Kathleen's reticence in making the trip, just use your imagination. But since Andy's back was much better and we were told the trail was recently graded, both of us made the trek for a weekend of bidding farewell to the Adam's, evaluation of the current housing and ministry situation, and future plans for incoming teams. Kathleen survived and actually is looking forward to returning in March to host the dental team! Another answer to prayer! Kwakwani is a mining town along the Berbice river, mostly Amerindian people, run a bit like the "wild west". Jungle. Hot. Humid. Wildlife. Please pray for the national pastors and their families throughout the ABC. Specifically for Prem and Anita, who are now alone doing ministry in the village of Kwakwani. Pray for full time co-workers to come alongside them, as the ABC is only able have a rotation of our pastors once a month going in to assist. Pray for the newly established Alness ministry and camp project. Work teams for January and February are forming to help build the wall surrounding the property. Pray for the funds needed to set up the team house in Kwakwani. 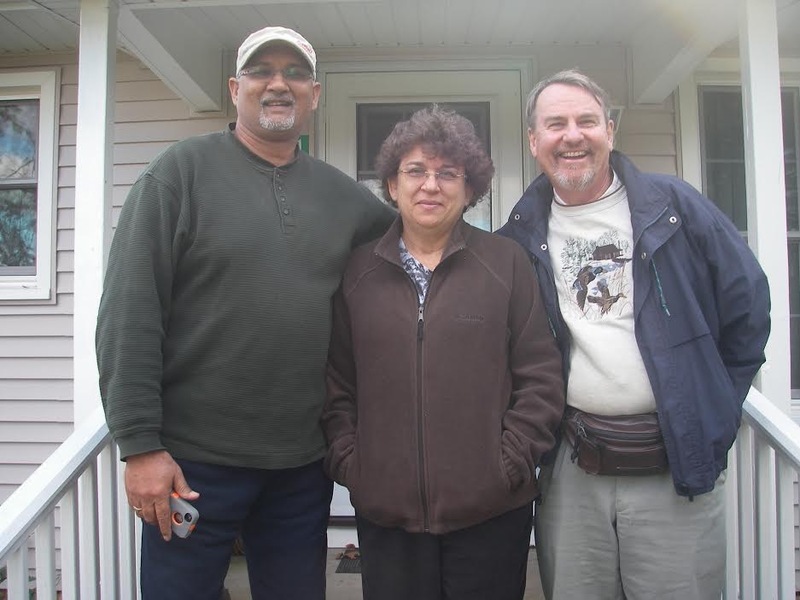 Pray for the new students in training for full time ministry: Sundar, Alex, Randy, Galina. Any support gifts toward the training of nationals is tax deductible and accounted for both by PIEI and the ABC, and given 100% as designated. Praise God, the container that was shipped out from Michigan in August arrived, the boat and motor is headed to Kwakwani, and everything has been unloaded, waiting to be sorted out and sent out! Already requests are coming in for the medical equipment and supplies. A HUGE thanks to all who contributed to this project - everything came through customs intact! We are indeed blessed to know that even though we are "on the front lines" doing spiritual battle among Hindus and Muslims, there are those of you on your knees praying on our behalf. Thank you for praying specifically for our health, safety, stamina, and spiritual strength. Is anyone else wondering how the summer has come and gone so quickly? Our short time here in the USA is fast coming to a close, as we prepare to fly back to Guyana on September 2. We are grateful for safety in travel to visit churches and supporting friends who partner with us in the ministry. Our last speaking engagement will be this coming Sunday, August 26, at Elk Rapids Bible Church. Since it is not far from camp, we are looking forward to one more visit with our daughter Naomi's family. We are very encouraged as we see the Lord provide for the needs of the Association of Bible Churches in Guyana. Our last update mentioned several prayer requests concerning finances: pastors in training, Alness church plant and camp property, and the items needed to fill the big shipping container. God is faithful, and provides what is needed when it is needed! Attached to this update are several pictures of the loading of the container, which amazingly was accomplished in just one day! And yes, Kathleen is very happy to see ALL of the accumulated stuff finally out of the shed and packed! It will take another crew to help unpack, sort, and disperse everything into it's proper place when it ends up at the Nigg house in Guyana sometime before Christmas, Lord willing. A HUGE thanks to all who came personally to deliver the blessings, some from as far away as Indianapolis, IN. And the men who literally put their backs to the boat, among many other heavy things to make the work so much easier. God bless you!! Note: The "fishing boat", oars, and outboard motor are headed to the Kwakwani ministry, which is located along the Berbice River. The river is like a highway through the jungle, so the boat will enable the work to expand even further in reaching more people in that area. Please continue to pray for the ongoing needs of the ABC, as we look toward 2019. The Alness property payment is due by the end of September, with $10,000 remaining. The Kwakwani ministry house purchase and remodel: $20,000. Alness fence/wall project, to secure the property: $20,000. Currently, a work team is forming to assist with building the wall in Jan/Feb 2019. Please contact us if interested in coming down to help! September marks the beginning of another semester for the students of the Berbice Bible Institute and Solid Rock Seminary Extension. Our first professor to arrive will be Dr. Rick Gregory, teaching the Pentateuch. Please pray for Rick and his wife Pat. She will also be teaching the pastors wives in a mini retreat setting, as well as a ladies Bible class for local churches. Again, we are so grateful for our praying and supporting partners who faithfully stand with us in the ministry of church planting in Guyana. We thank God for you. As you know we started the new church plant at Alness two weeks ago. We have seen good attendance and three decisions for the Lord. Two weeks ago also we started another house church at the # 19 Susanna area. Last Wednesday we had 40 from the village and ten or so trusted the Lord." The Alness ministry is headed up by pastor Vijay (Bushlot ministry pastor) and pastor in training Tony (working with us at Hampshire). The Susanna village house church is headed up by Bro. Jacob of the #19 Bible Church. Andy was involved in the initial start up phase for evangelism and outreach. The house church endeavor is going well, with all the ABC churches involved in reaching to surrounding villages with the gospel. Please continue to pray for the pastors and lay leaders as they seek to share the gospel in these new areas. For Andy and myself, while we are on a very short ministry schedule here in the US, it is time to catch up on medical exams, travel to give updates (in some churches to preach), and to enjoy our children and grandchildren. Naomi and Steve and three more of our grandkids are 3 hours north of us in their camp ministry, and Jennie and Ryan will be based right here in Lowell for the time being. Once again, we are so very blessed to know that our partners in the church planting ministry in Guyana stand with us every step of the way. Please continue to lift up the pastors and their ministries throughout the Berbice region, as the next two months will be filled with VBS, teams (hosted by pastor Vishal and Naomi in our home at Nigg), and the annual Youth Bible Quiz Off competition. Thank you for your faithful prayers and support. Currently, we have the privilege of hosting two men from Northwest Bible Church, MN in our home. Mark and Matt are here to conduct a retreat next week for the pastors and men in ministry training. After this weekend, the men head off to Georgetown and a quiet "rustic" retreat location where they can focus on teaching and training the pastors. Next month, Dr. Gerhard deBock will be arriving to teach the pastors and young men in training through the BBI/SRTS extension. He will have the opportunity to use the new air conditioned classroom at Tain for class, a first for any of our professors over these many years of training. We praise God for dedicated teachers like Gary who come alongside the ministry, and speak into the lives of these men. Thank you for your prayers for the national pastors, their families, and the ongoing ministry of church planting in Guyana. We are blessed and encouraged to know you stand with us...many for the entire 30 years of our ministry here! Good morning from your missionaries in Guyana! We have been hoping to send this out much sooner, but rainy days and goofy cameras got in the way...thank you for your patience and prayers for the completion of the Tain church renovation project! Below, you will see the final phase of the Tain sanctuary renovation and the new classroom (with AC!!) for the Bible Institute. The guys from Michigan, along with Andy and the Guyanese crew put in many long hours to truly "finish well". The Tain congregation was able to have their worship service yesterday in the beautiful new sanctuary. Praise God from Whom all blessings flow! If you have been reading our updates for any length of time, you will know that this is now the time of year when Dr. Scott Hodges and the team of dentists, hygienists, and dental techs arrive for the dental clinic ministry. Please be in prayer for the 31 member team, all of whom will be staying in our home here in Nigg. They will conduct a full service free dental clinic at the Tain church from March 4 - 8. Folks come from all walks of life, religious background, and even great distances to see this group of professionals for excellent dental care. Pray for the evangelistic team (our BBI students and pastors) as they share the gospel with each individual who comes through the clinic. Many people come together to make sure an event of this magnitude functions smoothly. It is with much gratitude that we close, knowing that it is through the prayers and gifts of God's people we are able to continue the ministry of church planting in Guyana. Thank you. The new year is upon us with a rush! All we can say is, the day is drawing even nearer when the Lord will return! Thank you for your prayers and encouragement as together we look forward to what this year will hold. Recently the Association of Bible Churches met together for the annual "Day of Prayer and Planning", to share not only in fellowship and the Word, but to plan and pray for the new year. In answer to your prayers for the month of December, we praise God for a busy but blessed Christmas season. The focus was truly on the celebration of the birth of our Savior throughout the churches in the ABC. Andy and other leaders were involved in assisting with preaching and music at their various activities and concerts. The bell choirs were active, thanks to a huge boost from our visiting friends Tim and Jody Kulke of Grace Bible Church in Indiana. Hand bells are a novelty in Guyana - actually musical instruments in general (with the exception of a few steel bands) are a rare thing here. So to have the bells in our churches gives them an open door for ministry through music in a unique way throughout this region of Berbice. Jody taught a "handbell workshop" held at our home during their visit, and as you can see by the pictures, it really helped us all to upgrade our performance. The Hampshire Bible Church, where we minister, was totally "lit up" for the Christmas season. Both inside and out! The men of the church came together and worked several days to string lights, fabricate large Christmas trees using metal rods and fabric, and make sure the fuse box didn't blow out! The result was that the church corner lit up the darkness of our village in a way that was a clear testimony for the glory of Jesus. Hindus celebrate Diwali, Muslims celebrate Ramadan, but WE celebrate Emmanuel - "God with us"! The children put together a simple but clear presentation of the birth of Christ. Even the little "sheep" cooperated and didn't give the shepherds too much trouble on Christmas Eve. Everyone saw how very much there is to be thankful for in sharing the story of Jesus. January 25: First work team from MI arrives to assist with the Tain church/BBI renovation project. February 2: Pastor Doug Knorr and men arrive, Doug to teach Proverbs at BBI/SRTS class, the men to work on the renovation project. 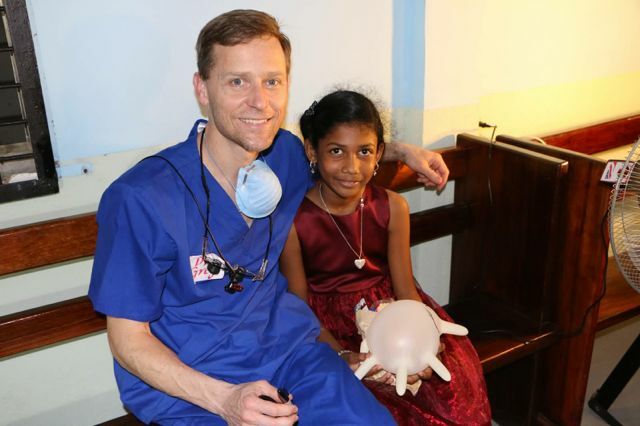 March 4-8: 30+ member dental team from USA to hold clinic at the newly renovated Tain Bible Church! Intense time of ministry through meeting dental needs as well as evangelism to hundreds of people coming through the clinic. May God continue to bless you as you remain "steadfast and immovable, always abounding in the work of the Lord" - right where you are! "Just a short note to thank you for your prayers while we were traveling and doing dentistry with the Guyanese team again. It is hard to believe but this has been the 15th year going to Guyana. All the suitcases made every connection and everyone stayed healthy. Please continue to pray for the team as they try to readjust to their normal daily lives post trip. Trying to get some much need rest. Preparing for boards for some. But most importantly continuing to experience of God in a new and fresh way"
added note from Kathleen on the work done this past week: Guyana has a dental culture of "pulling teeth", rather than trying to save them and doing preventive care. It is not uncommon for people in their 30's to have a full set of dentures as their teeth have already been pulled out due to decay. The dental teams have had a huge impact on educating both the population of Berbice in dental care, as well as the opportunity to work with the Guyanese dental students from Georgetown in teaching new techniques and the importance of hygiene/saving teeth. Again, we are so grateful for your prayers on behalf of the team. Lives were touched, souls saved, teeth cared for. Praise God from Whom all blessings flow! Where does the time go? We blinked and it's the month of March already! Time truly does fly by these days, so we are reminded once again that we need to redeem the time, and continue to "be about our Father's business". We serve a great and awesome God, who delights in answering the prayers of the saints. Thank you for your faithful prayers on behalf of the ministry of church planting in Guyana. 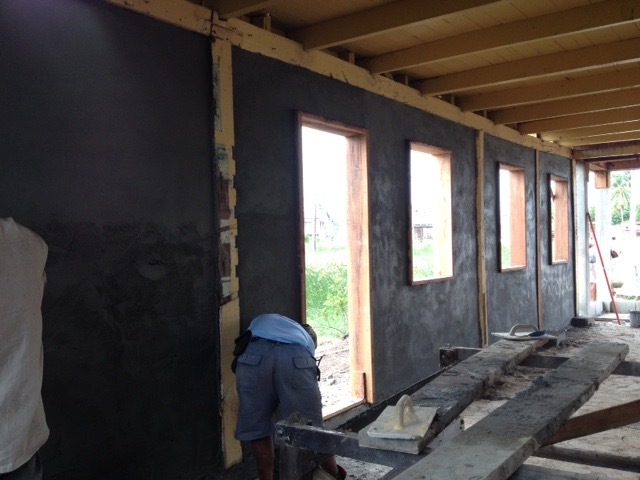 Once again, we are sending a photo update of this past week at the Tain parsonage project. The old house is really starting to look nice, as the finishing touches are going on. The ceiling is painted, bathrooms and kitchen tiled, electrical work is done, doors are hung, stairway is in place. Next week, the inside will be painted, plumbing goes in, and a bit more concrete to finish the inside driveway. Long days and short nights for Andy and the crew! Speaking of long days and short nights, the dental team arrives tomorrow morning, March 4. There are 30 people in this group, so Kathleen has been busy getting our house ready to host and feed them all. Lord willing, by this time next week, we will have a dental clinic photo update to send, along with a report of the 4 1/2 days of clinic to be held at the Bath Bible Church. Please pray for pastor Willow and his wife Evelyn, as they will be hosting the clinic at their church across the river. Pray for the dental team, the evangelistic outreach team of pastors and helpers, the hosts, and the hundreds of people coming through the clinic in just a few days. This is an intense time of coordinated effort on the part of the dentists, hygienists, their helpers, the ABC pastors, and those who cook, clean, do the laundry, and transport a group this size. It is a privilege to serve with you, our dedicated prayer and ministry partners in evangelism. May the Lord continue to bless and encourage you in your walk with Him. It's been a very busy week both here in our home at Nigg, and at the Tain project. Attached you will see a photo update of the progress on the parsonage. It's starting to look really nice! Many hands made light work on mixing and pouring all the concrete for the driveway going into the church yard from the road. Since this was also a week of classes for BBI/SRTS, the pastors "volunteered" to work a couple of afternoons on that particular area. Pastor Doug Knorr, his son Josh, and friend Jerry had a very tight schedule, between classes M-F (pastor Doug), and working at the project (Josh and Jerry). Pastor Doug also preached at the Tain Bible Church on Sunday, Josh preached at Hampshire, and both assisted in making our annual Valentine Sweetheart banquet special for the 20 couples who attended at Hampshire. Yours truly had her hands full taking care of little ones while parents took classes, and making sure the guys were well fed along the way. Lunches were shared with a different ministry couple from the ABC at our dining table every day, as Pastors Doug and Josh met with them for encouragement and counsel. Early this morning, we said our farewells as the last of the visiting crew made their way to the airport. Thank you, men, for your sacrifice of time, resources, and energy to come alongside us in the ministry. Thank YOU, our prayer partners, as we truly depend on your committed prayers on our behalf. Please pray for us and our national coworkers as we now prepare for the dental team due to arrive a week from today. There is still much to be done in preparation for the clinic. It will be held "across the river" in the Bath Bible Church. Pray for pastor Willow and his team there as they look forward to hosting the clinic from March 5 - 9. 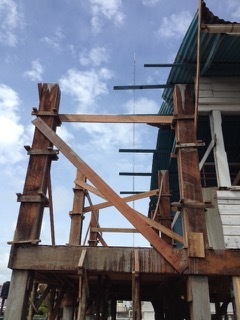 Continue to pray for the completion of the Tain project. The local crew will continue to work non-stop until the house is ready to move into...Lord willing, in just a couple of short weeks. 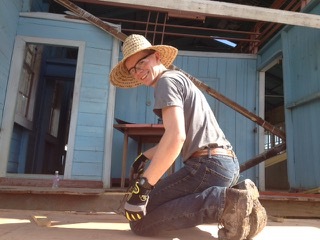 This past week the guys were really blazing the trail at the Tain parsonage project! The Michiganders and the national crew worked side by side to make amazing progress, as you will see by the attached pictures. Three sore, tired, but well fed men said their farewells on Wednesday night. We barely had time to change out the sheets on the beds before the next crew arrived, again from northern Michigan. We welcomed pastor Doug Knorr, his son Pastor Josh, and friend Jerry to our home very early Thursday morning. They had a very long trip coming in, but that didn't keep them from heading out the door to the project the afternoon of their arrival. Once again, we are so grateful for your continued prayers and support, from which we draw much encouragement and strength in the Lord. It has been another busy week of work at the Tain parsonage project! Lest you may think that all we do is pound nails and mix concrete around here, there is also a full ongoing ministry schedule to maintain as well. That is why we appreciate the extra hands who come alongside and give a boost to those who have boots on the ground. And on the scaffold. Next week Tuesday we say good bye to our young hard working friend Caleb, who leaves just before Mike, Joshua and Tony on Wed. Their time with us has gone by way too fast, and we will miss them. The same Wednesday evening, pastor Doug Knorr, his son Josh, and two other men arrive. 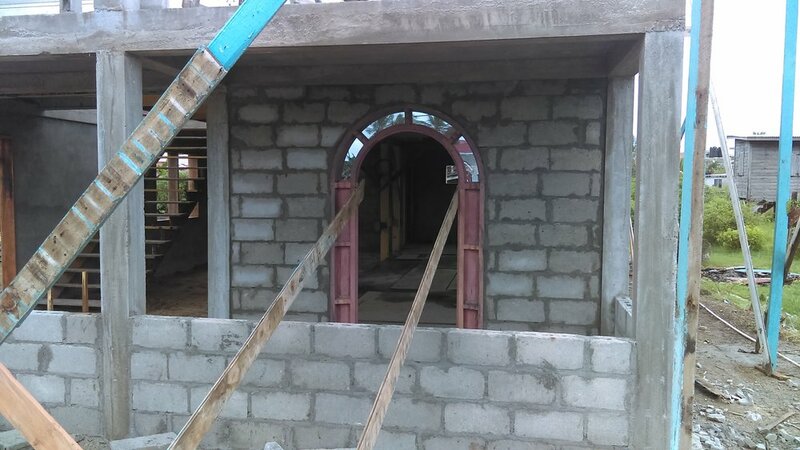 Pastor Doug will be teaching in the Bible Institute, and our crew at Tain will have three more men joining them, Lord willing to help finish the last stage of the parsonage project. 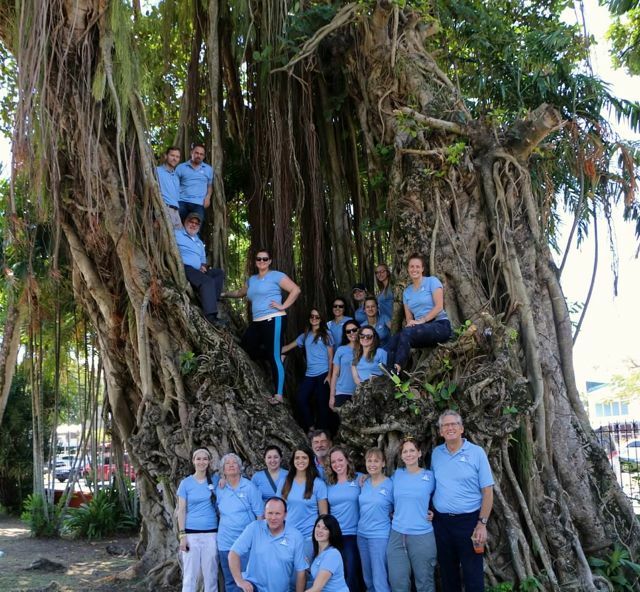 Warm and Sunny Greetings from your missionaries in Guyana! This has been a busy week for the workmen at Tain. 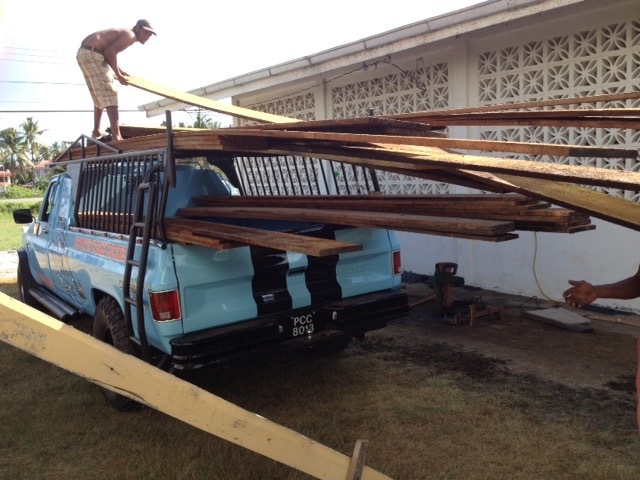 Andy, Caleb and the Guyanese crew have worked tirelessly as you can see by these attached pictures. Monday night, Feb.6, we will welcome three more men from Michigan to come alongside us in the endeavor. The guys have "saved" the roof for the new crew to tackle, so watch for the transformation in the next installment of the saga of the Tain parsonage project! Grateful for your support and prayers, Kathleen for us all. Thanks so much for your continued prayers on our behalf. Kathleen for us all. Thank God for continued dry weather and job safety! Warm greetings from your missionaries in Guyana! We will try to do weekly pictorial updates on the Tain parsonage project. This is the “first” sample of what the guys have been doing just in the past week…the "white" guy is Caleb Stagg, who came all the way from Tustin, MI to help with the project! So far the weather has allowed for long sunny workdays, with minimal rain interference. Thanks for your prayers on our behalf. Psalm 97:1 "The Lord reigns, let the earth be glad; let the distant shores rejoice." Warm greetings to you in this new year! As we look at the calendar for 2017, we realize we can make plans and set dates, but only God can accomplish what truly needs to be done. We look forward to what He has in store for our family, the ministry in Guyana, and in your lives as well. Our hope and trust is in the Lord, who reigns and rules over all. Thank you for praying for us as we travelled back to Guyana. The trip went well, until we were informed upon arrival that our expected driver, Bro. Ravi, had gone to the hospital that very day with a heart attack. (Bro. Vijay met us at the airport instead) Ravi is one of our leaders at the Hampshire Bible Church, a faithful brother in the Lord with a wife and four young children. God spared his life, he had surgery to open the blocked arteries in his heart, and praise God, he is able to serve the Lord and lead his family once again. So we literally "hit the ground running", or walking as is now the case with Andy. His knee is doing it's job, but he has had to learn to delegate more (which is a good thing), and enjoys once again being back with the work. We have attached some pictures of the parsonage renovation now in full swing at the Tain Bible Church. The Guyanese crew are at the site every day now to put in the foundation, and lay the groundwork for the men arriving from MI to assist. Our first visitor is Caleb Stagg, who arrives Jan. 18. Then three men arrive on Feb.6, who will then overlap with the next group arriving Feb.15. 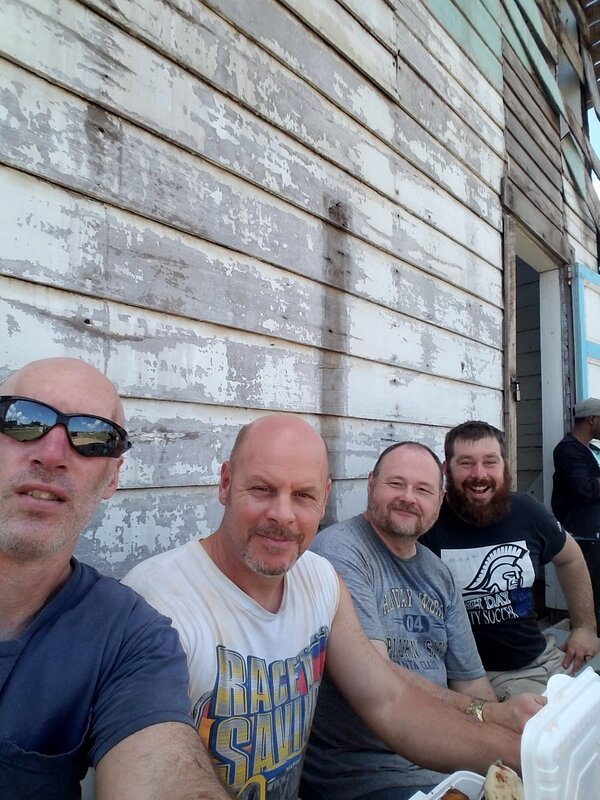 Please pray for these men, as they work alongside the Guyanese crew in this very hot and humid climate, for safety on the job, health and strength. Praise God for funds to complete the parsonage project! We look forward to see Him provide the needed additional $20,000 for the rest of the Tain ministry: fencing project and new building to accomodate the Bible Institute. Pastor Doug Knorr and his son Josh will be arriving with the last group, as pastor Doug is teaching a module at the Bible Institute and Seminary for our national pastors. On Feb. 19, the Hampshire Bible Church will host a special Sweetheart Valentine banquet for their couples. Kathleen will be hosting a different pastor/wife for lunch every day as they meet and fellowship with the visiting pastors as well during the week of classes. 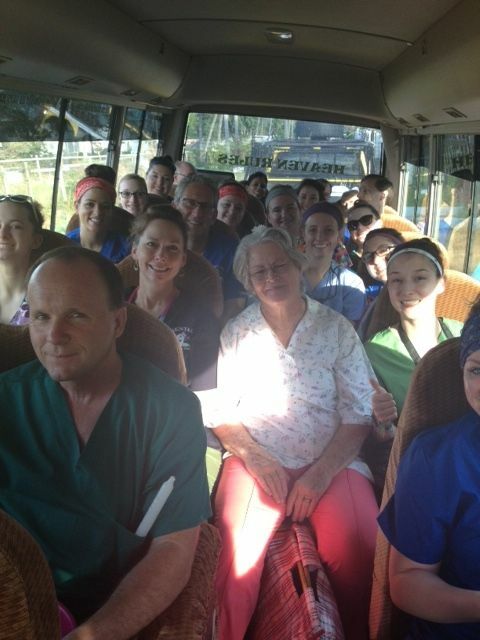 Please be in prayer for the 30 member dental team, under the leadership of Dr. Scott Hodges. They arrive March 4, and will be staying in our home here at Nigg. Their days will be long and their nights short, as they must travel "over the river" to the Bath Bible Church early every morning to work in the dental clinic. There are always many details involved in hosting a medical team, including the paperwork for the government approval, duty free concession, travel in country, set up of the clinic, and feeding and hosting this amazing group of dental professionals! We covet your prayers before, during and after this endeavor. We trust you had a wonderful Christmas as you remembered the birth of our Lord and Savior Jesus Christ. We were privileged to share the holiday with our children and grand children. Below, you will find a photo reminder of the urgent project request going out today...the Tain parsonage project. 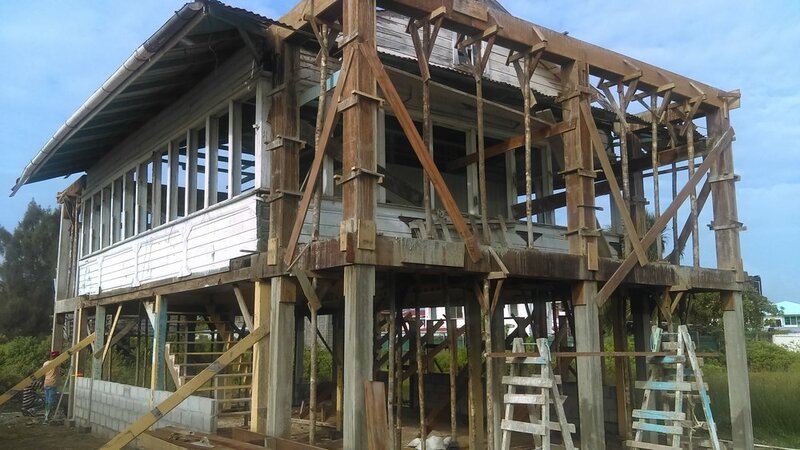 Yes, as soon as we return to Guyana January 5, the wheels will be turning to get all the materials on site and the renovation underway. As of this date, the project is seriously underfunded, but we are trusting God for the finances to at least complete the house in time for pastor Steve and his family to move in before the end of February. It is not too late to consider sending a gift toward the Guyana building project fund through PIEI. There are a few northern friends committed to coming down to help build, but the bulk of the work must be done by our Guyana crew. They are hired labor, so the request going out today is for the remaining $30,000 needed for the Tain work project. This is enough to renovate the old house on site, as well as build the wall around the church yard, and begin building the new Berbice Bible Institute classroom next to the parsonage as well. Every little bit helps and every dollar is used as designated, stretched as far as it can possibly go in seeing this to completion. All gifts are tax deductible, and can be sent directly to our mission, or through online giving. Please request the funds go towards the Guyana building project fund. Please feel free to email us with any questions, we would love to hear from you! It's been a busy morning! Thanks to Kathleen's brother Tim Wittenbach and his crew for moving and loading the crates. Thanks to Greg Koster and NTB trucking for hauling the crates to the dock in New York. Thanks to all who had a part in bringing the needed "stuff" that went into the crates! We are looking forward to being on the receiving end when the ship finally unloads in Guyana to unload and disperse everything - hopefully by early February. The Association of Bible Churches in Guyana is blessed to have such wonderful partners here in the USA to come alongside them in ministry. Blessings to you this Christmas and always! "And the angel said to them, 'Fear not, for behold, I bring you good news of great joy that will be for all the people. For unto you is born this day in the city of David, a Savior, who is Christ the Lord." We are sending you Christmas greetings from snowy Michigan this year! It has been many years since we have been able to spend Christmas with our family, so we are blessed to have the opportunity to be here. Thank you for your prayers, beautiful cards, and calls of encouragement. Andy had a rough few weeks after surgery, but praise God, is getting around much better these days. His regular therapy sessions will continue through the end of December, and as you can see by the attached photo, he is able to stand now and get around most of the time without aid. Our children and grandchildren will be able to join us for Christmas the week before we return to Guyana on January 4. We were invited to attend a special event honoring our friend Dr. Scott Hodges recently. The West Michigan Dental Association presented him with their "silent bell award" for his many contributions to dental health in the community and around the world. It has been our privilege to host Dr. Hodges and his dental teams who have partnered with us in Guyana for many years. They are even now preparing to return again in March, 2017 with at least 30 team members. 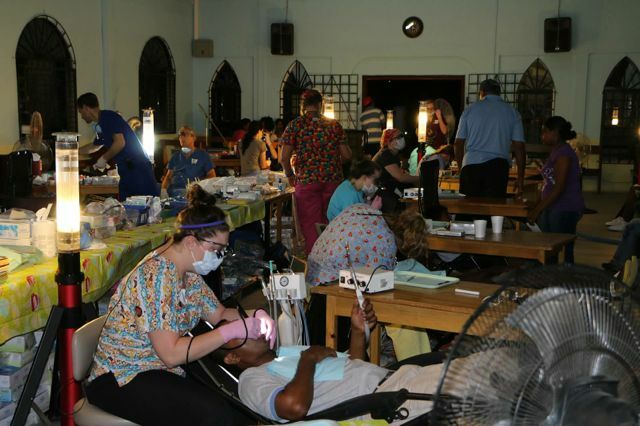 The impact they have had through dental care in Guyana, as well as the eternal impact of evangelistic outreach to the hundreds coming through the clinic, is beyond estimation. Please pray for the many details of preparation both here in Michigan and Guyana as we anticipate the dental team March 4-11. Speaking of teams, Andy has been busy (in spite of being a semi-invalid) making phone calls and meeting with folks to put together small work teams for January-February. The Tain parsonage/fence/school project is still on the agenda, so if there is anyone at this late date still wanting to join us for a week or so and help with the construction, it's not too late! Andy has plans laid out and the goal is to have pastor Steven and his family in the renovated parsonage before the dental team arrives, Lord willing. Please pray for the needed funds for this project to come in, safety on the job site, and all the details of getting this done in time. There have been opportunities for us to visit some of our supporting churches for fellowship and as Andy is able, to even preach. We have one more date for Andy to preach before heading back to Guyana, so if you are in the area we would love to see you! The service is at Alton Bible Church in Lowell, MI at 11am on December 18. The next event on our personal calendar is the shipping out of two large crates! The crates are packed and ready to go to the docks in New York, where they are loaded onto a ship bound for South America. A special thank you to all who so generously gave of their time, treasure, and even travelled long distances to assist to bring donations of the many needed and useful items to be packed in our shed. Yes, this is a project that requires a storage shed, lots of wood, screws, and muscle to put together, not to mention the packing, loading, and hauling overland to the docks. Lord willing, both crates will be delivered to our house in Guyana before February, unpacked and distributed before the dental team arrives in March! We have so much to be grateful for at this season of thanksgiving and joy. We look forward to the new year with anticipation as we return to the ministry of church planting in Guyana. Blessings to you and yours this Christmas! ..."a time to heal" ... Andy had his knee replacement surgery on October 27, and was home 24 hours later! Nurse Kathleen has had her hands full keeping track of his pain meds, ice on the knee, and making sure he does his therapy. Praise God, he is already making good progress and gaining more mobility by the day. We have been blessed by the kindness of many friends and family who call, bring food, and visit us. We enjoy visitors, so if you're in our area, please let us know and stop in sometime. The "before surgery" picture includes one of our Canadian brothers whom we met in Guyana as a missionary! Ian and his wife Linda stopped by just before Andy's trip to the hospital. ..."a time to break down, and a time to build up"... You know we can't let this note pass without mentioning the next work project in Guyana! Already work teams are being formed to join us in January and February 2017. The plan is to renovate the old house on the Tain church property to house pastor Steven Inasi's family. There is a lot to do at Tain, so if the funds are available, a building for the Bible Institute must be put up, and a wall to enclose the church property needs to be built. We are trusting the Lord to provide, He always does. If you or someone you know are interested in helping with this project by way of joining a work team or sending funds, please call us at the number listed at the top of this page. Now is the time to talk to Andy about anything concerning the ministry! He would love to be able to share and explain the latest developments and how you can partner with the church planting team in Guyana. The goal is to be back in Guyana by January 4, Lord willing. There is much to do there once we return, so we covet your continued prayers during the remaining time here in the USA. Our Guyanese brothers are faithfully doing the work of the ministry in our absence, and assure us that all is well. Not a week passes that we don't hear from one of our Guyanese brethren. They keep us informed and are great at calling or emailing. This is the age of technology, which brings even those who are far away very close to us! We trust that this Thanksgiving season will find you rejoicing in the many blessings of the Lord of the Harvest. He is LORD of all the earth! Thank you for praying for us as we made the journey back to Michigan after a very busy but fruitful 8 months so far this year in Guyana. The Lord is using the medical expertise of several doctors and therapists to help in the slow but necessary healing process for Andy's knees. We are learning to wait on the Lord for His time as to the exact date for surgery, and will keep our prayer partners posted when that does happen. Currently, Kathleen is in Guyana through Sept.22, as she has the privilege of hosting two men from MI. Pastor Bob will teach the book of Nehemiah in the BBI/SRTS extension next week, and his friend Terry will be using his carpentry skills to build benches. Kathleen has her Guyanese friend Shellie staying with her as together they make sure these guys are well fed and on time for everything. Andy is still in Lowell, keeping busy with doctor appointments and connecting with some ministry partners in between for meetings and encouragement. We have a few pictures (below) to just give a visual update on what recently occurred here in Guyana, as well as what one of the goals are for next year in Guyana. First, the team pictures are from the week that Pastor Jim Samra and his family, along with the team from Calvary Church were here in August. They had a great week of teaching VBS in two different locations, assisting at the ladies Rally day at Hampshire, and evening evangelistic crusades. It was a packed week of ministry which saw many decisions for Christ as well as the edification of the saints. The pictures of the "old house" are to help visualize the next phase of construction at the Tain Bible Church. The house was purchased and moved next to the church. The goal is to recruit a "work team" to come early 2017, along with the needed funds, to renovate this house into a parsonage for pastor Steven and his family. Please pray with us that the Lord would provide the team(s) and monies needed to accomplish the task at hand. Any questions can be emailed directly to us, we will be happy to give more information and details for this and other projects on the horizon. It is a privilege to be able to share once again the ongoing work of the Lord here in Guyana. The church planting efforts of the house churches, the faithful ministry of the national pastors in their villages, the weekly television broadcast, and the Bible Institute continue on in spite of our absence. The goal is to return to Guyana the first week of January, 2017, Lord willing. We covet your prayersfor those who are truly "on the front lines" of the harvest and we are so grateful for your faithful support which enables us to partner together for the glory of God in Guyana. The year is flying by for us, as you all have probably experienced in your own lives. There is much to be thankful for as we have seen the Lord's constant abiding love and faithfulness. Recently we have shared concerning the new baby born to pastor Alexa and his wife Debra. We are grateful to report that baby Lydia is doing very well, and was able to be in church for the first time this past Sunday! She is truly a living miracle of God's mercy and grace, and a testimony of answered prayer. Thank you for praying for the VBS/crusade team from Grace Bible Church, IN. Pastor Pete Helland and his group had a very effective ministry in spite of the oppressive heat and humidity of July! Many decisions for Christ were made in the services held at both Tain and Hampshire villages. New believers are coming out to church, and the pastors are encouraged by the response of many who are opening up to the gospel. This week, Pastor Jim Samra and his family will be arriving along with 12 other team members from Calvary Church, MI, for ministry. They will conduct VBS for both Bushlot and Hampshire villages, as well as evening crusades in different locations around the village of Hampshire. Lisa Samra is the speaker for the annual ABC Ladies Rally on Saturday, August 6, to be held at the Hampshire Bible Church. Please pray for this team, that they will be able to minister effectively in the hot August temps, to the children, ladies, and families they come in contact with. Packed into this schedule there is also an opportunity for this team to go into the local orphanage home and "love on" the children one morning. Just three days after the team flies out, we will be returning to Michigan for an extended period of time so that Andy can have the surgery he needs to repair his knees. Please pray for us, as we go through this period of expected surgery and recuperation. We have a few speaking commitments, a wedding, and a brief visit to Guyana in September (Kathleen) to host Pastor Bob Sponable and his friend as well during this time. The BBI/SRTS classes continue into the fall with pastor Bob teaching the book of Nehemiah, and Dr. Boodram teaching Ecclesiastes. Andy's messages are broadcast weekly, in spite of his absence, thanks to Marks work in editing and generous gifts sent through PIEI. We are finding God's grace and strength to be sufficient as we trust Him each day. We covet your prayers for our national pastors here in Guyana, as we leave the oversight of the Association of Bible Churches in the hands of Pastor Vishal. 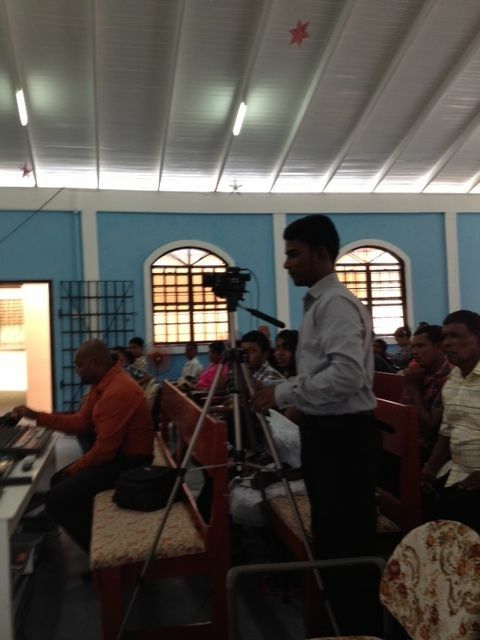 The ministry of church planting, discipleship and evangelism continues whether we are in Guyana or not, praise God! There is a seasoned ministry couple arriving from MN for a few weeks in October to assist with the Hampshire Bible Church, please pray for Don and Meg as they take on this responsibility in our absence. Once again, we are so blessed to be able to share with our special friends and prayer partners what the Lord is doing here in Guyana. Your partnership in our lives and ministry is a great encouragement as we serve for the glory of God. It is time to give you an update on our little Lydia Daniella. I realize the last note concerning her situation was very optimistic. I have since come to realize that her condition is much more serious than we were first informed. The doctors and nurses here do not communicate well, if at all, concerning the true status of a patient, although this private hospital is doing better now that I am on their case. I found out that the nurses who care for Lydia like to tell the parents and myself "baby might be discharged today", when actually the opposite is true. Without going into the details, suffice it to say, I am SO thankful to have a "mother/baby" nurse daughter (Jennie) that keeps me informed as to what is really going on. It has been an emotional roller coaster for myself and Jennie these past 5 days. We decided it was best to have Debra move back into the hospital so as to be close to the baby and nurse (feed baby) on demand. Praise God, the hospital agreed to give her a room for only $10 US per day. Arrangements have been made to have a church lady cook and send meals for her. (hospitals here do not provide food). This is actually a blessing, as Debra has consistent caring and praying visitors in and out several times a day. Alex is now fully informed as to the seriousness of Lydias condition, at my insistence. Remember, the medical profession here is about 50 years behind modern medicine in every way. They have a nice little room with one incubator in this hospital, but it has become quite evident that the nurses are not confident in even running the incubator properly. I have to bite my lip, since it is very difficult for me to keep my mouth shut when it comes to making certain observations. The medical profession in Guyana simply are not trained to discuss patient information, answer questions, offer insight into what to expect, etc. After much agonizing prayer and making sure that Debra was well cared for, I decided to join the ladies in Georgetown for the pastors wives retreat. So as I write, I am in the hotel where we will be having our meetings for the next 3 days. Our speaker, Indra Boodram, has arrived from Tobago with her husband, daughter, and friend. I actually considered canceling this retreat due to the events of recent days, but have peace about going forward. The Lord has shown me that this hotel will become a place of prayer as our pastors wives come together and pray for Alex and his family during this time. This is what we know for sure: Lydia must be in "baby ICU" through this week Saturday. We still are taking a day at a time. Alex and Debra know that every day with Lydia is a gift, and they are grateful for the precious life they have in the moment. Thanks to Jennie's medical contacts, there are two Neonatologists now communicating directly with Lydia's doctor. Praise God for this major blessing!! Pray that with the information they can now glean through the overseas doctors, the antibiotic and oxygen therapy, the nurses care, Alex and Debra's love, and the prayers of God's people around the world, this little one's life will be spared. We are trusting God for a miracle. Thank you for the encouraging notes along the way. We are so blessed to have a praying support team! Please continue to pray for all those who are caring for this precious baby. Today I am sending out an urgent prayer request for one of our young pastors family. Alex and Debra were married last year shortly before pastor Robert (Canje Bible Church) died. This young couple immediately took on the mantle of leadership of the Canje Berea Bible Church. A few months later, they were excited to announce that they were expecting their first baby. Yesterday morning, a beautiful baby girl, Lydia Daniella, was born to Alex and Debra. Thanks to the generosity of our supporters, we have a special medical account at PIEI to cover the private hospital expenses incurred in ensuring a safe environment for our pastors families. I was able to be by Debras side during labor and delivery, so saw first hand the concern and then immediate reaction of the nurses and doctors when Lydia was born. She had ingested meconium in utero and is being treated for serious complications from that. Debra was discharged this morning from the hospital, so is staying in our home where I can see that she has proper nutrition and new mother care. The baby will stay in baby ICU as long as it takes to stabilize her situation. Please pray for this family. Debra is looking forward to attending the pastors wives retreat in Georgetown next week, but of course we all are looking at the health of mother and baby first. Pray for a miracle recovery with no complications for baby Lydia. Our little private hospital here in Berbice is not fully equipped to deal with newborn emergencies. The baby is not able to travel to Georgetown to a larger hospital, but even then, there is no neonatal doctor in all Guyana. Pray for Debra's recovery from childbirth, her separation from baby (we will visit as often as possible), and the emotions, hormones, etc. she is going through. Pray for Alex as he must care for his congregation and pastoral responsibilities throughout this time in addition to his family's needs. Pray for me, as I care for Debra, and for wisdom to deal moment by moment with whatever may happen. We are trusting in the Great Physician, knowing that our God will carry us all through by His grace. Once again we write to update our beloved prayer and support partners in the ministry of church planting in Guyana. At times we need to be reminded that the One who called us is faithful, and He WILL do it! (I Thess. 5:24) It is such an encouragement to know that there are so many who come alongside the ministry of the Association of Bible Churches. We are truly blessed and grateful. These past few months have been filled with incoming guests who left the comforts of home and the demands of life and work to minister to our people. They have shown what it means to "spur one another on toward love and good deeds". In April, we had visiting pastor/professor, Aaron Browning and one of his leaders, Mark Loar in our home. They taught on "Church Polity" and did an excellent job communicating to the BBI/SRTS students. A week later, our annual "Day of Prayer" (see pics) highlighted the need to serve one another, as demonstrated by the washing of feet. It was humbling to see so many of our leaders desire to show their love in this way to one another. The last week of April, our daughter Jennie, her family, and a team of medical professionals from Faith Baptist Church, MI came. They worked hard as every day they traveled to a different village and ministered to the churches and their people. This proved to be an effective way to reach several hundred women and teen girls with much needed health care and information. Their love for the Lord shone through every outreach and had a huge impact both physically and spiritually in lives. (see pics of Jennie's family and team) This team also was privileged to bring back little Diraj to his parents, the child from Hampshire that Kathleen sent for surgery on his cleft palette and lip to MI in January. Praise God for modern medical care and the "Healing the Children" foundation. Following the all too short week of medical ministry with Jennie's team, the Clevenger family stayed on for one more week of teaching. Ryan taught a BBI/SRTS course on "The Trinity", and Jennie continued with daily clinic, home, and hospital visits in the Nigg area. Grandma and Grandpa Girwarnauth took advantage of the extra time with Eleanor to spoil her as much as possible! Immediately following the medical outreach in April, an optometry team, led by Dr. Julie Hanson, arrived on May 8 to set up clinic in the Fyrish Bible Church for a week! This team was ably hosted by the Crabwood Creek pastor and his wife, Vishal and Naomi. Hundreds of needy Berbicians came for free eye care and glasses, as well as hear a clear presentation of the gospel. Many accepted Christ. We have been blessed with excellent visiting professors this year, including Dr. Jim Thompson, from Wilton Bible Baptist Church in AL. He taught the book of Romans in May to the pastoral students. Along with all the guests, our life and ministry here at the Hampshire Bible Church, as well as within the ABC continues at a steady pace. We have been protected so far from mosquito borne viruses, which accelerate during the current rainy season. The road traffic continues to be hazardous, praise God for daily protection as we travel from one end of this region to the other. The weekly television broadcast goes out with the help of our faithful assistant, Mark. Sunday morning messages are taped, Mark edits them, the DVD is dropped off at the station on time. Technology is a wonderful way to reach thousands with the gospel! Folks from all walks of life share with us how they are challenged, encouraged, and blessed by these messages, to the glory of God. - House Churches starting up: So far 10 new "house churches" have been started since January of this year, all across the Berbice region as extensions of the Bible Churches, their pastors and members. - Kwakwani ministry: We have been asked to come alongside this ministry started years ago by the ABC, in the interior of the Berbice region. Pray for missionaries Scott and Faith Adams, as they consider the BBI/SRTS students Prem and Anita we are sending to them for continued mentoring and training. - Andy's Knees! It has become necessary for us to return to the USA this fall for Andy to get much needed surgery on his knees. We will keep our support family updated as to when he will be able to preach/share/visit as able. Thank you for reading and praying over this rather long and detailed newsletter! We appreciate YOU, your prayers, and faithful support. Thank you for praying for the dental team! 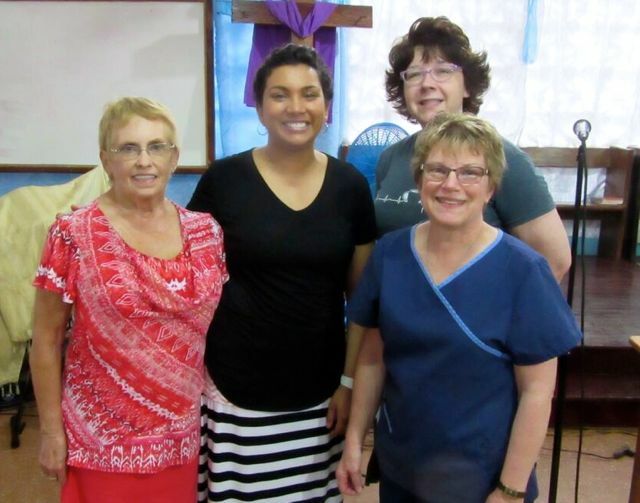 Last week, 25 dental professionals, including dentists, assistants, hygienists, and helpers, came to Guyana to work with the Association of Bible Churches. This year they set up clinic in the Bushlot Grace Bible Church. During the four and a half days of "hard labor", they were able to see over 540 people of all ages come through. Everyone heard a clear gospel presentation, had their teeth cleaned, and were able to get fillings, root canals, restorations or extractions if needed. Praise God, there were 47 decisions for Christ during the week. It was a privilege to work alongside these dedicated servants, who were willing to work long hours to provide excellent care to all who came in. We have attached several pictures to help visualize all that transpired in such a short time. Again, we are truly grateful to all who prayed for the team, the Guyanese helpers, and ourselves, as it was an intense time both physically and spiritually. Please specify Guyana for all tax deductible gifts: national pastors account, projects account, or Girwarnauth's support. We have chosen the above verse as a reminder to all of us that indeed, we do not grieve as those who have no hope. At the same time, we are comforted, knowing that our Lord and Saviour holds the keys to both life and death. (Rev.1:18, Matt. 5:4; 16:19) We appreciate all who remembered our family in prayer as Kathleen's brother Jon went through the valley of the shadow. On January 30, Jon entered the presence of his Redeemer, surrounded by his loving family in California. Kathleen had the privilege of returning for a short time to see Jon (having travelled to CA with our daughters and her sister), and then to be with her parents and other members of the family in MI just before returning to Guyana. Kathleen returned to Guyana on Feb. 2, just in time to join Andy in hosting several visitors. The first were ministry friends from Canada, followed by pastor Doug Knorr and Dave Croad from MI. Pastor Doug did an excellent job teaching the book of Hebrews to our pastoral training students. We were also blessed to have these men host our annual Hampshire Bible Church Valentine Date night! Food, fun and fellowship were had by all. Many are wondering about the camp land project, and progress in that area. Please continue to pray that the owner for the property in Bushlot is able to travel from New York and finalize the purchase of the land. His wife has been very ill, making it necessary for him to postpone his trip. In the meantime, Andy and the ABC board have been very busy working together on mapping out the goals and progress of the ministry in general. Their board retreat notes are available for those who would like to see the direction they feel the Lord is leading for the future. One of our long standing goals has been to train an assistant for Andy in the "Final Revelation" taping and editing. For years, Andy has done it all himself, which takes hours every week to prepare for the weekly television broadcast. Praise God, a young man named Mark has taken up the challenge, and has proven to be faithful, conscientious, and diligent to perform the tasks required. (see attached pics). It is such a blessing and delight to see this dedicated young man sacrificially give up his free time to spend a LOT of time in our home working on the broadcast. He has become like a second son to us. Please pray for the 26 member dental team, due to arrive here in Guyana on March 5. They will be staying in our home here in Nigg (we have a lot of bunk beds!) and traveling each morning early for their all - day clinic at Bushlot Grace Bible Church. (Pastor Vijay and Mala) This dedicated team of doctors, hygienists, and assistants work long hours to provide excellent, free care to hundreds of Guyanese. This is an amazing week, not only for the wonderful dental care that our people receive, but for the fact that every single person coming into the clinic also hears the gospel clearly shared, are prayed with, and shown the love of Christ. It is an intense time of ministry in every way, in which we know from experience is also preceded and followed by spiritual warfare. So your prayers for the dental team, the pastors doing evangelism, the cooks, hosts, and numerous helpers, cannot be underestimated. The team flies back to the USA on March 12. We love and appreciate you all so much. Thank you for so faithfully bringing us before the throne of grace. Note: the piei.org website has a "giving page",(support for national pastors in Guyana, national director for Guyana (Andy Girwarnauth), projects for Guyana, as well as a "Guyana page" for pictures, updates, etc. As we look back over this past year, we again marvel at how our great God has brought us through. We are sure that you can say a resounding "Amen" as well, as this life we live is such a gift from the hand of a loving God. Yes, there are always trials and difficulties to face, but our Shepherd knows how to lead us through each one and proves his faithfulness in every situation. We have decided to share some pictures of some of the events from this past month, as together with our Guyanese co-workers and friends, we celebrated the birth of Christ. Attached you will see the Hampshire Bible Church all lit up with the message of Christmas, including the huge cross and star outside the building. People come from all around to see the display of lights, as there is nothing else like it in Berbice. And of course Christmas in Guyana would not be complete without parties, food, and fellowship! It is a joyous time to come together and celebrate the birth of our Saviour. Kathleen hosted the pastors wives in our home, there was the ladies party at church, the kids party, and the mens party... which meant they cooked a huge pot of curried sheep meat with roti! (sorry, no pic for that one) .And yes, there was a night of caroling through the village, which meant decorating trucks and filling the back ends full of singers and sound equipment! Christmas morning in Guyana means everyone gathers at church for an early service of singing Carols and Christmas message. It was a wonderful time of worship, along with special music with the bell choir and children's choir, followed by sharing out of Christmas apples,snacks, and toys for the children. More fun and fellowship followed later on, as we were joined in our home for lunch by three families, all very dear to us in the ministry. We received a special gift later on in the day from our own dear family in the USA, as our children and grand children all were able to FaceTime and talk "face to face"! We look forward to a new year, and have already filled the calendar with teams, teachers, and special events. Please pray with us as we seek follow the Shepherd into uncharted territory once again. We can make plans, but only God knows the outcome and what lies before us. So we ask for wisdom, perseverance, health and strength to do what God has laid out for us. Specifically for the month of January, pray for the ABC board retreat which is designed to bring together all the pastors to pray, plan, and work through goals for the next five years. Pray for the purchase of the camp property as the owner is due to arrive from New York during the month of January for the transaction. Pray for the ongoing ministry of discipleship, training, and church planting throughout this region of Guyana. Pray for Kathleen's younger brother Jon and his family, as he is dying of cancer. Jon knows the Lord but it is difficult to go through this as a family. We trust that you will be encouraged and blessed as you enter into another new year of service to our Lord. Thank you for your partnership through prayer and support of this ministry.